If nothing else, “Dead Snow” is easily the best film ever made about Nazi zombies, the kind who still have a bloodlust after 65 years or so of being dead. That’s enough to hold down a feature-length film right there, but on top of working with a story that pretty much writes itself, “Dead Snow” takes it to a level that’s as fun as it is powerful, sort of like those “Evil Dead” movies that Sam Raimi made years ago. 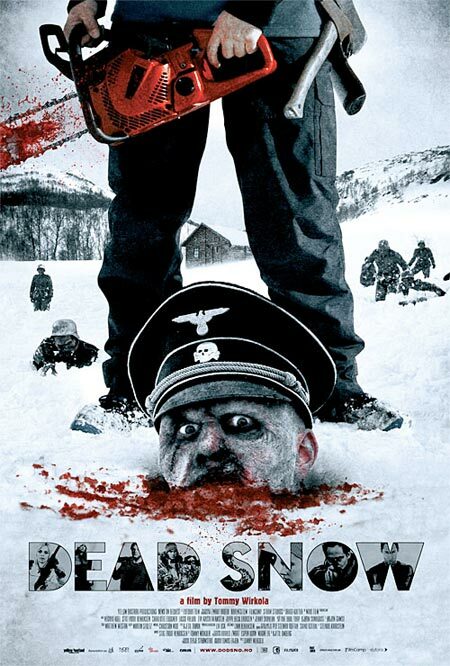 Even though Raimi hasn’t made many zombie movies lately, “Dead Snow” does a good job picking up where he left off. Nazi zombies are about as bizarre as it gets, but at least the heroes here are prepared to take them on. They might be a bunch of medical students who live all the way in Norway, but even they’re familiar with the “Evil Dead” films, not to mention more obscure stuff like “April Fool’s Day.” All that horror-movie knowledge should come in handy when they’re holed up at a cabin in the woods during their winter break, as they find out when they get a visit from a loony wanderer (Bjørn Sundquist) one night. He says that there was a time when the Nazis had a unit in this area, where they eventually died of hypothermia. It’s a safe bet that he knows what he’s talking about – eerie natives in these kinds of films usually do. It isn’t long before the Nazi zombies show up and cause trouble for everybody in the cabin, and they’ve even remembered all their basic training. (One of them gets a laugh just by surveying the humans with binoculars.) As if going up against zombies who are ready for war weren’t enough already, they also feast on human flesh, just like in the movies. That doesn’t necessarily mean they’re hungry, though – when you’re in the heat of battle, there’s no wrong way to take out an enemy. One of the reasons why “Dead Snow” works as well as it does is that although it’s aware of how silly it is, the dramatis personae here have no idea why they’re ripe for parody. The Nazi zombies take themselves so seriously that they don’t acknowledge the camp value of the things they do, or even stop to think why anyone who just got resurrected would need to do them. In light of all that snow they have at their disposal, you’d think they’d try to open up a ski lodge or something. I just received my degree in journalism at Brooklyn College, where I served as the arts editor for one of the campus newspapers, the Kingsman. When it comes to the arts, I’ve managed to cover a variety of subjects, including music, films, books and art exhibitions. I’ve reviewed everything from “Slumdog Millionaire” (which was a good film) to “Coraline,” (which wasn’t) and I’ve also interviewed legendary film critic Leonard Maltin.